Jennifer J. Ottesen received her B.S. in Chemistry from the University of Chicago, where she worked on the development of transition metal catalysts in the laboratory of Lawrence Sita. 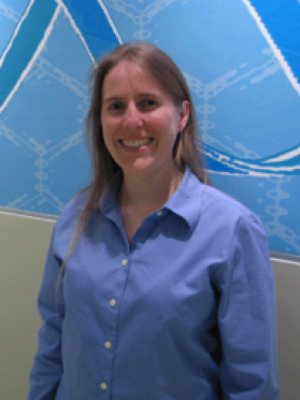 She was an NSF Graduate Research Fellow studying with Barbara Imperiali at Caltech and MIT, and received her Ph.D. in Biological Chemistry in 2001 for work developing discretely folded mini-protein motifs. She was a Merck Postdoctoral Fellow in the Laboratory of Synthetic Protein Chemistry at The Rockefeller University, studying with Tom Muir to apply synthetic peptide and protein chemistry with a particular focus on the role of phosphorylation in dynamic regulation of Crk-II and Smad2. She joined the faculty of OSU in 2005 as an Assistant Professor in the Department of Biochemistry, and was promoted to Associate Professor in the Department of Chemistry & Biochemistry in 2012. She is a member of the Ohio State Biochemistry Program (OSBP), Biophysics, and the Chemistry & Biology Interface Training Program (CBIP). She received the Dean’s Award for Undergraduate Research Mentoring in 2008, and was awarded an NSF CAREER Award in 2009. Research in the Ottesen laboratory uses peptide and protein chemistry to address biological problems. The Ottesen group is developing improved techniques for solid and hybrid phase chemical ligation, which allows the rapid recombination of peptide elements into larger macromolecules. A primary direction for this research has been understanding the effect of histone post-translational modifications such as acetylation and phosphorylation in chromatin structure and function through the efficient generation of precisely modified semi-synthetic nucleosomes (Figure credit: Ryan Yu, Yu et al, Org. Biomol. Chem (2016)). For a full listing, please see my bibliography at ResearchGate or at Pubmed/NCBI. Yu, R.R., Mahto, S.K., Justus, K., Alexander, M.M., Howard, C.J., Ottesen, J.J. "Hybrid Phase Ligation for Efficient Synthesis of Histone Proteins", (2016), Org. Biomol. Chem. 14, 2603-2607, doi:10.1039/C5OB02195B. Wike, C.L., Graves, H.K., Hawkins, R., Gibson, M.D., Ferdinand, M.B., Zhang, T., Chen, Z., Hudson, D.F., Ottesen, J.J., Poirier, M.G., Schumacher, J., Tyler, J.K., "Aurora-A Mediated Histone H3 Phosphorylation of Threonine 118 Controls Condensin I and Cohesin Occupancy in Mitosis", (2016) eLife 2016;5:e11402 doi:10.7554/Elife.11402. Howard, C.J., Yu, R.R., Gardner, M.L., Shimko, J.C., Ottesen, J.J. “Chemical and Biological Tools for the Preparation of Modified Histone Proteins” (2015). Top. Curr. Chem. 363, 193-226. Brehove, M., Wang, T., North, J., Luo, Y., Dreher, S.J., Shimko, J.C., Ottesen, J.J., Luger, K., Poirier, M.G., “Histone Core Phosphorylation Regulates DNA Accessibility”, (2015). J. Biol. Chem. 290(37), 22612-22621. Bernier, M. ,Luo, Y., Nwokelo, K.C., Goodwin, M., Dreher, S.J., Zhang, P., Parthun, M.R., Fondufe-Mittendorf, Y.N., Ottesen, J.J., Poirier, M.G., “Linker histone H1 and H3K56 Acetylation Are Antagonistic Regulators of Nucleosome Dynamics”, (2015). Nat. Comm, doi: 10.1038/NCOMMS10152. Chatterjee, N., North, J.A., Dechassa, M.L., Manohar, M., Prasad, R., Luger, K., Ottesen, J.J., Poirier, M.G., Bartholomew, B.B. “Histone acetylation near the nucleosome dyad axis enhances nucleosome disassembly by RSC and SWI/SNF (2015). Mol. Cell. Biol., 35(23, 4083-4092, doi: 10.1128/MCB.00441-15. North, J.A., Simon, M., Ferdinand, M.B., Shoffner, M.A., Picking, J.W., Howard, C.J., Mooney, A.M., van Noort, J., *Poirier, M.G., and *Ottesen, J.J. “Histone H3 Phosphorylation Near the Nucleosome Dyad Alters Chromatin Structure” (2014). Nucleic Acids Research, 42(8), 4922-4933. Shimko, J.C., Howard, C.J., Poirier, M.G., and *Ottesen, J.J. “Preparing Semisynthetic and Fully Synthetic Histones H3 and H4 to Modify the Nucleosome Core” in volume “Protein Acetylation: Methods and Protocols” (2013) of Methods in Molecular Biology, 981, 177-192. DOI: 10.1007/978-1-62703-305-3_14. Mahto, S.K., Howard, C.J., Shimko, J.C., and *Ottesen, J.J.; “A Reversible Protection Strategy to Improve Fmoc-SPPS of Peptide Thioesters by the N-Acylurea Approach”, (2011). ChemBioChem, 12. 2488-2494. DOI: 10.1002/cbic.201100472. Simon, M., North, J.A., Shimko, J.C., Forties, R.A., Ferdinand, M.B., Manohar, M., Zheng, M., Fishel, R., *Ottesen, J.J., *Poirier, M.G., (2011). “Histone Fold Modifications Control Nucleosome Unwrapping and Disassembly”, Proc. Nat. Acad. Sci. USA, 108(31), 12711-12716. DOI: 10.1073/pnas.1106264108. Li, X., Fekner, T., Ottesen, J.J., Chan, M.K. “A Pyrrolysine Analog for Site-Specific Protein Ubiquitination”, (2009). Angew. Chem., 48(48), 9184-9187. DOI: 10.1002/anie.200904472. Ottesen, J.J., Bar-Dagan, M., Giovani, B., Muir, T.W. (2008) "An amalgamation of solid phase peptide synthesis and ribosomal peptide synthesis." Biopolymers 90(3):406-14. Ottesen, J.J., Huse, M., Sekedat, M.D., Muir, T.W. (2004) "Semisynthesis of phosphovariants of Smad2 reveals a substrate preference of the activated T beta RI kinase." Biochemistry 43(19), 5698-706. Cowburn, D., Shekhtman, A., Xu, R., Ottesen, J.J., Muir, T.W. (2004) "Segmental isotopic labeling for structural biological applications of NMR." Methods Mol Biol. 278, 47-56. Wilson, K.A., Kalkum, M., Ottesen, J.J., Yuzenkova, J., Chait, B.T., Landick, R., Muir, T., Severinov, K. and Darst, S.A. (2004) "Structure of microcin J25, a peptide inhibitor of bacterial RNA polymerase, is a lassoed tail." J. Am Chem. Soc. 125(41), 12475-83. Ottesen, J.J., Blaschke, U.K. Cowburn, D. and Muir, T.W. (2003) "Segmental isotopic labeling: Prospects for a new tool to study the structure-function relationships in multi-domain proteins." Biol. Mag. Res. 20, 35-51. Mezo, A.R., Ottesen, J.J., and Imperiali B. (2001) " Discovery and characterization of a discretely folded homotrimeric betabetaalpha peptide." J. Am. Chem. Soc. 123(5), 1002-3. Ottesen, J.J. and Imperiali, B. (2001) " Design of a discretely folded mini-protein motif with predominantly beta-structure." Nat. Struct. Biol.8(6), 535-9. Imperiali, B. and Ottesen, J.J. (1998) "Design strategies for the construction of independently folded polypeptide motifs." Biopolymers 47(1), 23-9. Struthers, M., Ottesen, J.J.and Imperiali B. (1998) "Design and NMR analyses of compact, independently folded BBA motifs." Fold Des. 3(2), 95-103.